Salons and spas are places of relaxation and pampering for women. The barber shop could be called the men’s equivalent. Barber shops are places where men gather to talk and laugh about sports, girls, work and family. They expect to leave feeling invigorated and confident. The middle class man can’t afford to pay too much for his haircut. He also can’t sacrifice quality because like women, men want to feel polished and presentable. A man especially wants diversity at his barber shop. He wants his barber to be familiar with all types of hairstyles, for himself and his sons. Most of all he wants his barber to be personable, remember his name and the haircut he prefers. A modern interpretation of the classic barber pole with the words CHAD’S BARBER SHOP printed in blue against a red banner adorns the front window. When a client steps through the door at Chad’s Barber Shop he is welcomed by several barbers. Then they can sign in on the iPads on the Check-In Magic kiosk. Customers will hear non-stop music playing streaming via internet radio. Customers see and hear barbers laughing and joking with the men in their chairs. It may be a bit cramped during busy hours but no one seems to mind standing until a seat opens up. Most people inside are kind enough to offer their seat to a woman, child or older man standing without a chair. Recent renovations have given the shop a warm streamline aesthetic. Dark mahogany wood cabinets line both sides of the shop. The new barber chairs are comfortable and modern. The vending machine and custom cup holders attached to the waiting chairs are great touches. Since opening Chad has kept his prices fair and affordable. Chad’s regular prices range from nine to thirty-two dollars. Chad and his barbers need to make a living but they understand that many of their clients are facing financial difficulties of their own. The barbers at Chad’s appreciate that their clients still come to a true barber shop rather than alternative chain shops. Clients pay a few more dollars than at a non-traditional barber shop but the barber shop experience is worth the few extra dollars. Not only that, but they offer many services that franchises do not. Chad’s Barber Shop offers boy’s cuts at twelve dollars, senior cuts at nine dollars and thirteen dollar discounted cuts for firefighters, police officers, and military service members. Beard trims, hot towel shaves, and line ups range from seven to fifteen dollars. In addition to all of the standard options Chad’s also offers appointments upon request for an additional six dollars, availability may vary. Designs are priced according to size and intricacy. Full service haircuts include haircut, hot lather shave around the ears, line up and goatee trim for seventeen dollars. Chad’s Barber Shop was recently able to expand its hours of operation thanks to added employees and the constant demand for their services. Chad’s new hours are Monday through Friday 8:00am to 6:00pm, Saturday 8:00am to 3:00pm and Closed Sunday. Chad has been able to provide more opportunity for his employees to earn money and for his customers to get a quality haircut 6 days a week. Each of Chad’s barbers are trained and certified. They each have their own specialties and unique skills. Some do older styles best, some do designs, boy’s cuts or long cuts but each of them can deliver a quality cut any day of the week. If a client asks for it the barbers at Chad’s can most always deliver. Unlike franchises Chad’s offers beard trims, straight razor shaves, and everything that a classic barber shop entails. Chad’s barbers never shy away from challenging and intricate designs and unique haircuts. During football season visitors will see all types of NFL logos with colorful designs on the heads of boys of all ages. The clients can bring in pictures of a design for the barbers to cut, and the finished product is more akin to art than a haircut. Halloween means clients will be asking for pumpkins and skulls. During the Christmas season barbers decorate heads with the Grinch as well as Christmas trees. The end of the year has everyone anticipating fresh starts, as well as fresh haircuts. Plenty clients leave with The New Year’s mark embellishing their head. All year round barbers are providing clients with ornate works of barbering art. Also, many men choose to remember a loved one by having their name, a cross, or a colored ribbon shaved into their head. During its thirteen years of business Chad’s Barber Shop has built a reputation for the type of barbers it employs. Each barber boasts skill and professionalism. Chad and his barbers cut like champions every day of the week. In a small business the employees are what define it. They are the face and reputation. They determine the quality of service and professionalism. All of Chad’s barbers make a point to remember every client and their preferred haircut. Everyone wants to feel special. Chad’s barbers do an excellent job at making everyone who sits in their chairs feel important. Clients know they’re not just a good tipper, a fidgeting child or a picky client to them. Regardless of the type of person in their chair, Chad and his barbers are courteous to all. They grant every client their best skills despite predisposed expectations. With all that Chad’s Barber Shop has to offer, it would be a surprise if anyone chose not to experience their great service and skill at least once. From affordability to diversity, they offer it all. The greatest point to be made is that clients know they are not only getting quality for their money but they are keeping Indianapolis’ working class alive. Chad is a proud family man, business owner and employer but most notably, he is keen on giving back to Indianapolis. Chad’s Barber Shop is reminiscent to the older gentlemen, fresh and appealing to the younger man and fun and exciting for children. Chad’s barbers are skillful, professional, innovative and personable. With their new extended hours even the busiest Hoosier can enjoy a haircut at Chad’s Barber Shop. 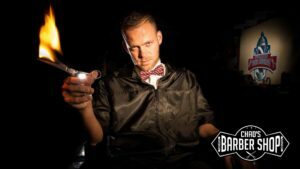 Visit Chad’s Barber Shop and experience a refreshing new spin on old school barbering. Jump back in time to 2012 and watch this vintage youtube video!